Belmont Adjunct Commercial Strings Instructor Tracy Silverman recently wrote an article that was featured in the world’s foremost classical string magazine, The Strad, published in London. The article, originally titled “Evolved or Endangered: Survival of the Fiddle-ist” appears in the October 2018 issue and discusses the importance of incorporating popular idioms on strings. Silverman has also just published The Strum Bowing Method: How to Groove on Strings, an innovative method he’s been teaching at Belmont and in clinics all over the world for the last 15 years. It is now available on J.W. Pepper, Shar Music and at StrumBowing.com. 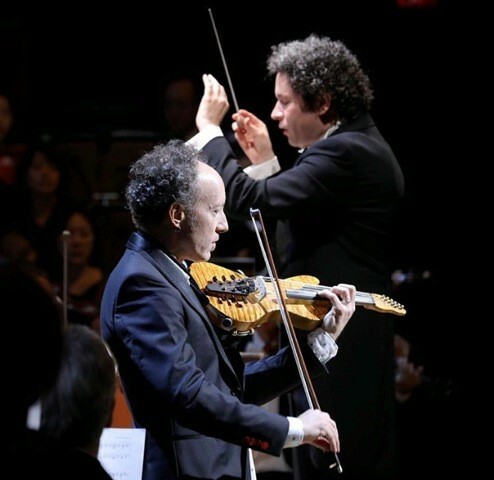 Silverman also recently appeared at Walt Disney Concert Hall as a soloist with the Los Angeles Philharmonic conducted by Gustavo Dudamel playing John Adams’ “The Dharma at Big Sur”, a concerto for electric violin. He will be performing it again on Oct 5 & 6 with the Cincinnati Symphony Orchestra.